Home lessons Control: You Can Take Control of YOU! Above all, be careful what you think because your thoughts control your life [Proverbs 4:23 (ERV)]. Gain control of your thoughts, think of heavenly things not the earthly. Afterall, Jesus said, “you should be kingdom-minded” (Matthew 6:33). Lesson focus: Colossians 3:5 & 6. Bible lesson background: Colossians 3:1-11. Learn to take control of YOU! So put to death anything that comes from sinful desires. Get rid of sexual sins and impure acts. Don’t let your feelings get out of control. Remove from your life all evil desires. Stop always wanting more and more. You might as well be worshiping statues of gods. 6 God’s anger is going to come because of these things [Colossians 3:5-6 (NIRV)]. The KJV says to “mortify therefore your members [parts of the human body]”. In other words, do not let sinful thoughts, desires, and/or feelings control you. Mortify – G3499 νεκρόω nekroo (ne-kro’-ō) v. 1. to deaden. 2. (figuratively) to subdue. 3. to deprive of power, destroy the strength of. [from G3498] KJV: be dead, mortify. 1) Power or authority to check or restrain. 2) discipline in personal and social activities. So put to death and deprive of power the evil longings of your earthly body [with its sensual, self-centered instincts] immorality, impurity, sinful passion, evil desire, and greed, which is [a kind of] idolatry [because it replaces your devotion to God] [Colossians 3:5 (AMP)]. 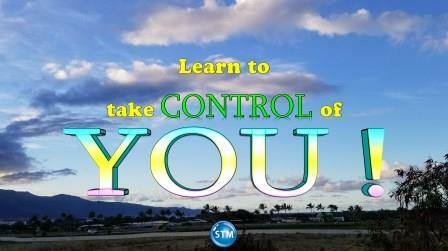 My dear brothers and sisters learn to take control of YOU! Do you want to suffer God’s wrath? If your thinking is controlled by your sinful self, there is spiritual death. But if your thinking is controlled by the Spirit, there is life and peace. 7 Why is this true? Because anyone whose thinking is controlled by their sinful self is against God. They refuse to obey God’s law. And really they are not able to obey it [Romans 8:6-7 (ERV)]. You must take control of YOU if you want to obey God. So, stop doing what your sinful-self wants, use the power/ability God gave you and be led by the Spirit! Dear friends, your real home is not here on earth. You are strangers here. I ask you to keep away from all the sinful desires of the flesh. These things fight to get hold of your soul [1 Peter 2:11 (NLV)]. Colossians 3:1-11 (5 & 6); Proverbs 4:20-23; Matthew 6:25-34 (33). Romans 8:1-11 (6-7); 1 Peter 2:11-12 (11). (ERV) Taken from the HOLY BIBLE: EASY-TO-READ VERSION © 2001 by World Bible Translation Center, Inc. and used by permission. So kill (deaden, deprive of power) the evil desire lurking in your members [those animal impulses and all that is earthly in you that is employed in sin]: sexual vice, impurity, sensual appetites, unholy desires, and all greed and covetousness, for that is idolatry (the deifying of self and other created things instead of God).